SJO Singer Celebrates 80th Birthday! 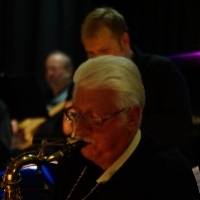 Steve Bailey --the crooner who has fronted the SJO Big Band (Surrey Jazz Orchestra ) for well over 40 years celebrates his 80th birthday this month - and he still performs with great energy and dynamism! On Tuesday 26th March he will again be entertaining a packed crowd at the Jacobs Well Village Hall with his mix of Frank Sinatra/Bobby Darrin etc style songs. The SJO is Surrey's longest surviving big band, playing music of the big band era -- from Glenn Miller , Count Basie, Duke Ellington etc --this terrific band has been together for the best part of 50 years playing great swing and jazz tunes - that suits all ages. The SJO Big Band holds concerts every last Tuesday of the month at the Jacobs Well Village Hall --and on 26th March the concert is in support of the David Shepherd Wildlife Foundation who exist to raise vital funds supporting front line conservation projects which help secure a future for wildlife in their natural habitat. Support both Steve Bailey and this excellent charity by attending on March 26th. For more information contact Peter Deane -07770 882855 or peter.deane@ntlworld.com. or see the website www.surreyjazzorchestra.com. The SJO Big Band (Surrey Jazz Orchestra) is renowned for the fantastic music that it creates and the passion and excitement that those that hear it gain – getting those toes tapping and bringing light into the lives of the audience. A real bunch of clever guys and gals! 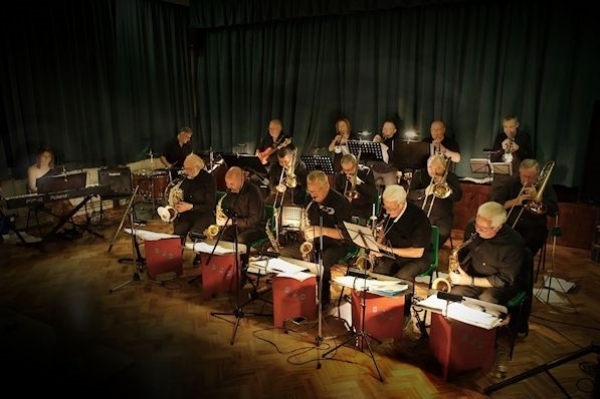 The SJO Big Band play a range of music and tunes from people that you will have heard of like Count Basie and Duke Ellington as well as some of the more modern swing stars.